…when exposing your stomach and back is back in fashion. A typical sight around Beijing when it gets a little hot: the men of Beijing (the young, the old, the slim, the not-so-slim..) will hitch their t-shirts up, tuck them under (or over) the top half of their t-shirts, leaving their stomachs and backs open for public viewing. Guys, does that really even cool you down? Either way, it’s not really the most pleasant of sights. It is a sign however, that Summer is here. The wind that blows over you when you step outside is warm, and the sun – hot. The temperature has been within 25°C and 30°C over the past few days, and it’s going to get hotter still. Last night I went to have dinner at Al-Ameen, a Lebanese restaurant, and realised after that I should have written some reviews throughout the year of restaurants I’ve eaten at! 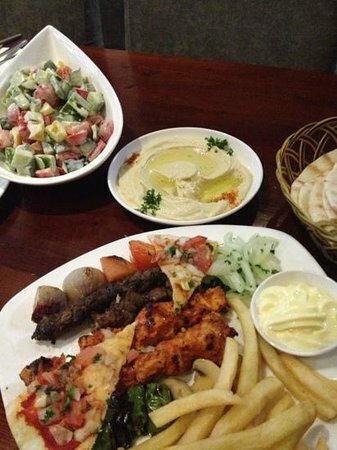 Some of the information online is outdated, and I could genuinely have provided some information on eating out (the Halaal way) in Beijing, but alas, it’s a little late for that now… Hummus and Falafel though, yum! The highlight of today was dealing with an issue we had with our electricity top-up card. I often miss the way how things just work in the UK, whereas here, if something works, we’re surprised. Pleasantly, at least. It shouldn’t be like that though! We have a card with which we can go to the bank and top up our electricity meter as and when required. A few days ago when we tried, we were unable to ‘buy electricity’ (as we say in Chinese), and told that there was a problem with the card. Sigh. We called the number given, were put on hold and told that ‘the line is currently busy, please wait in line or hang up now’. If I’m calling, clearly I want to speak to someone, why would I hang up?! Instead, after a few minutes of ‘waiting in line’, we were hung up on. And not just once, not twice, but three times. Thank you. Very. Much. Trying our luck today at the bank once more, entertaining the idea that the card not working was a temporary, one-off problem, and still being unable to top up, we were given yet another number to ring. This one took us straight through to a woman who told me that we had to go to the office of the State Grid company, in order to replace our card. We have no idea why, but it needed to be done if we wanted to buy ourselves more electricity before our current supply ran out. Off we went to find this address, and from then on, it was a pretty smooth procedure…. The answer to life, the universe and everything? NO! I know she was only trying to help, but it really wasn’t a huge change, as they made it out to be, and it probably took more time to understand this via the attempted English explanation over the phone than it would have had she just tried once more. And that was actually, probably my best experience with systems in China. Doesn’t that say a lot? Posted in Foody, Lifestyle and tagged bank, culture, electricity, fashion, food, language barrier, Muslim, phone, qingzhen, restaurant, Summer, system, t-shirt, weather. Bookmark the permalink. …but a typical insight into daily life in China. Last Friday, we went to try out a Xinjiang cuisine restaurant about 5 minutes walk away from where I live, which we’d kept meaning to go to, since it was so close. I’d been here with my brother way back in my first week in China, but due to a combination of, a) – not being accustomed to the food yet, and b) – not knowing the cuisine well enough to know what (and how) to order, it’d be an understatement if I said that we were not the restaurant’s biggest fans. As expected, given our now-excellent ordering skills, and acquired taste for the food, last Friday’s was a much better experience. 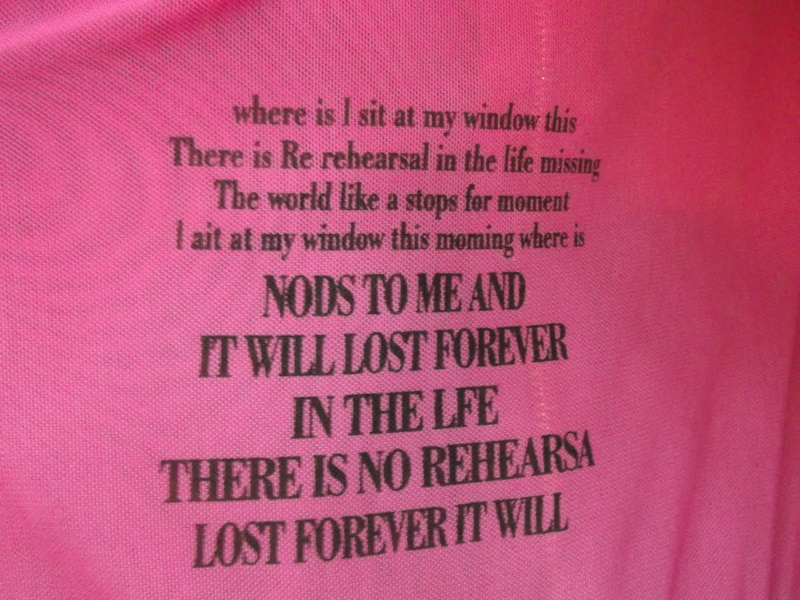 On the bottom half of the back of a pink t-shirt. Makes total sense to me. 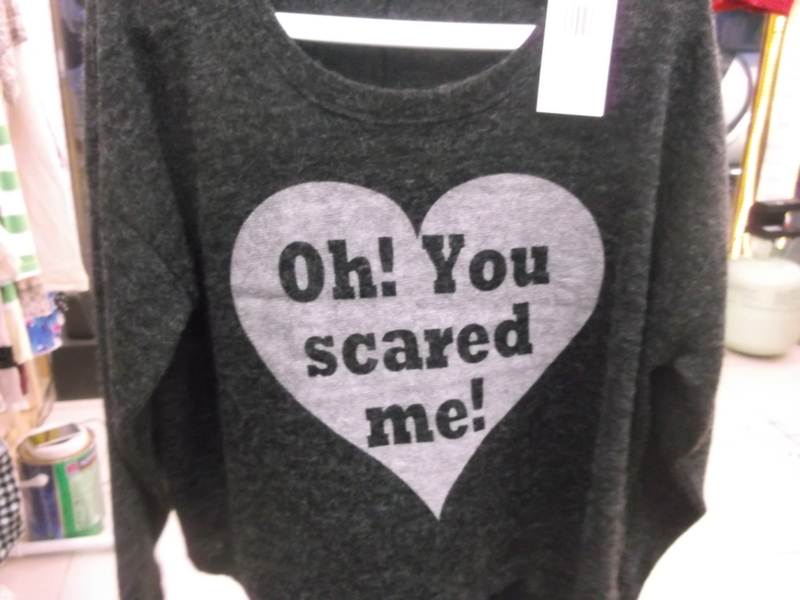 The heart on your shirt could suggest otherwise. The clothes were surprisingly cheap for the look of the shop though, even for China. 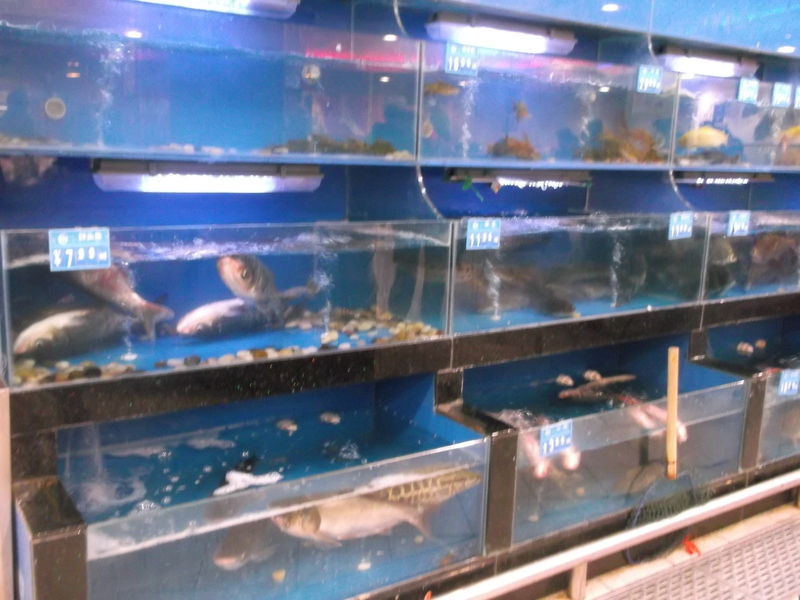 A lot of the tops were only 25RMB, but none of us bought anything. I’m not sure if I’ve mentioned how weird most Chinese fashion is to us… as you can see from the above examples. We spent a good while in there though, quite literally sifting through every item of clothing and amusing ourselves. When we left the shop, possibly 15minutes later, I commented that the woman inside might have been quite annoyed with us, having spent so long looking around and then left, having bought nothing. “Actually,” corrected Nafeesah, “spent so long looking through all the clothes and LAUGHING at them, and then left!”. Yeah, about that… Oops. A little further up the road, was a supermarket. that despite being so close to us, is not one we usually frequent. (This is because there is an even closer, albeit smaller, one for most of our daily needs.) 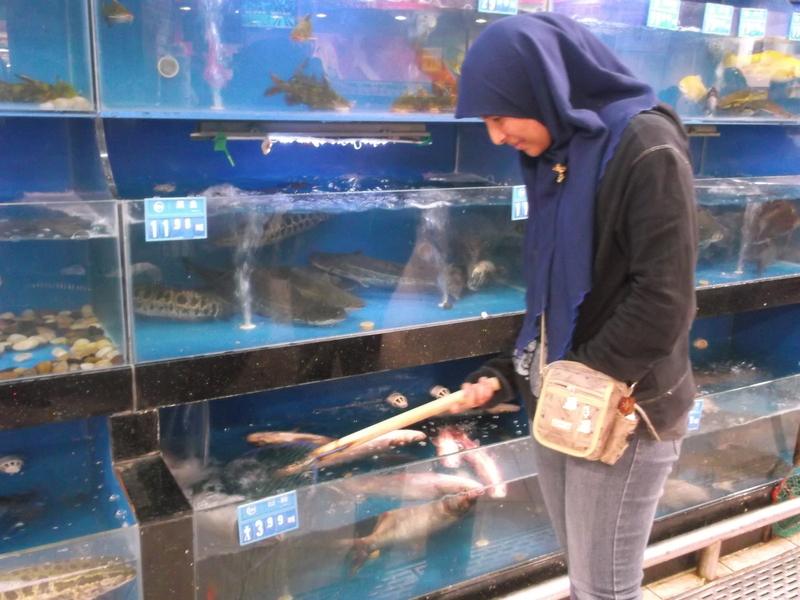 Some of the following pictures are not meant to be amusing, (though some are), but just to show a little of what the inside of a Chinese supermarket is like. 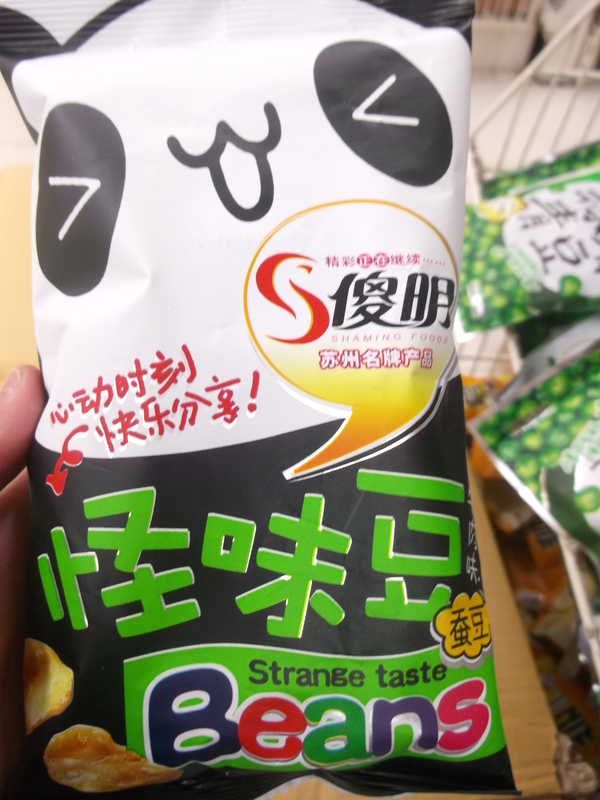 Strange taste beans?? I’ll take 20!! I just put the characters for ‘strange taste’ into my dictionary app, and it translates it as ‘strange odour’. They’re both equally strange beans to have, anyway. Not only is the fish counter, very literally, alive, it’s also self-service! 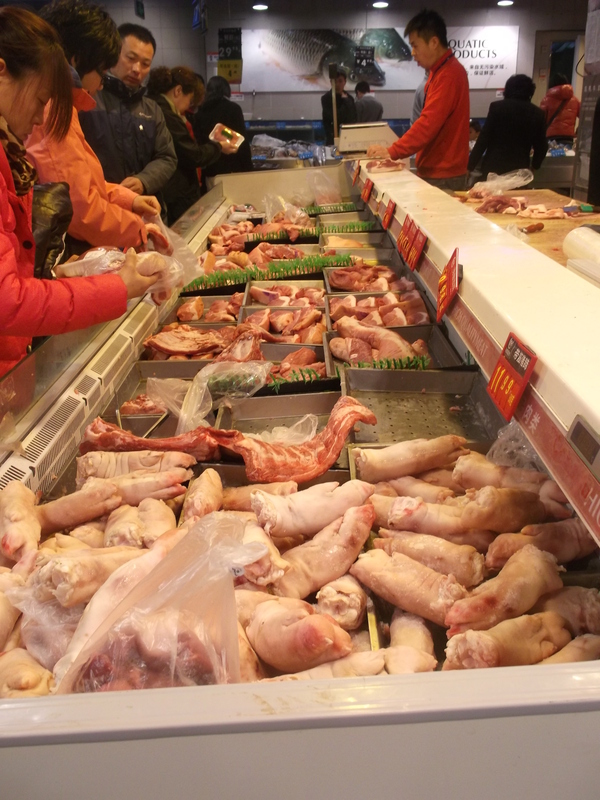 Part of the meat counter… some nice pig feet in the foreground here. At least this looks vaguely like a refrigerated section. In the ‘butchers’ outside, i.e. not in supermarkets, the meat just hangs…. outside, a lot of the time. Who said raw meat needed to be kept cool?? Rice and lentils…and stuff. No Tilda Basmati though, sadly. …So cats can enjoy a holiday at home! 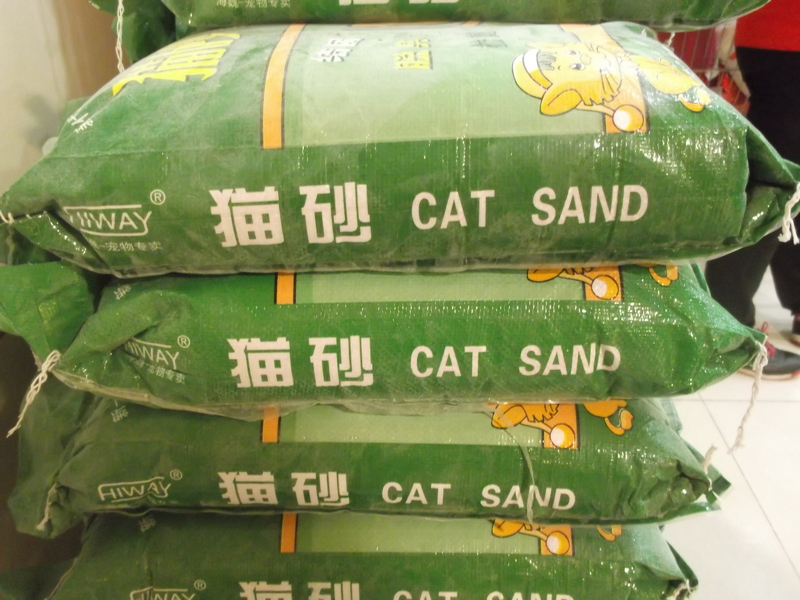 Admittedly, I don’t know anything about taking care of cats, but I’m sure I’ve never seen or heard of ‘cat sand’ before. Anyone care to enlighten me? 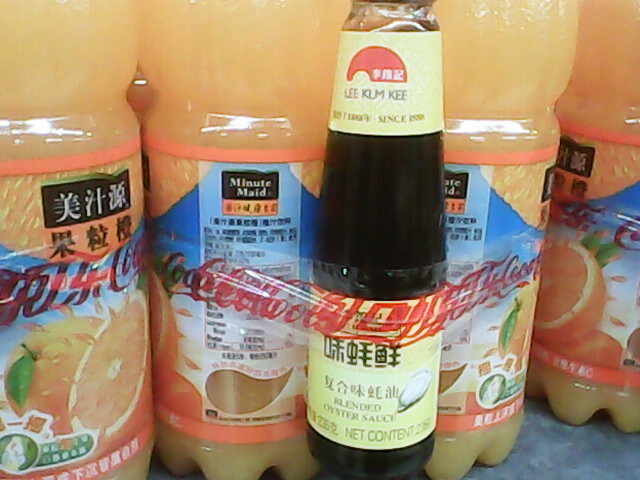 Free soy sauce with your orange juice. So stereotypically Chinese! 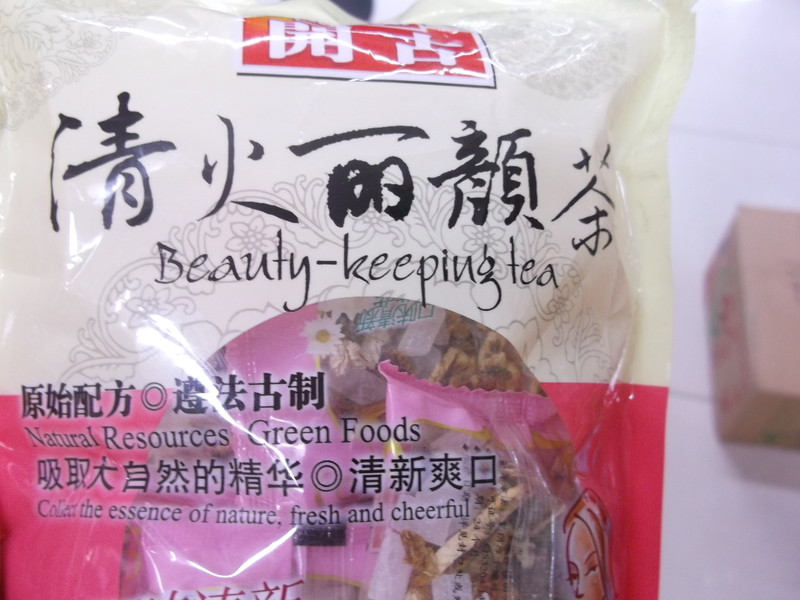 Posted in Beijing: My Year Abroad, Chinglish, Foody, Lifestyle and tagged adventure, cheap, Chinglish, clothes, fashion, fish, food, meat, restaurant, rice, shopping, supermarket, Xinjiang. Bookmark the permalink. Naturally, I’m sure a lot of you are interested in knowing what I’m eating in China. 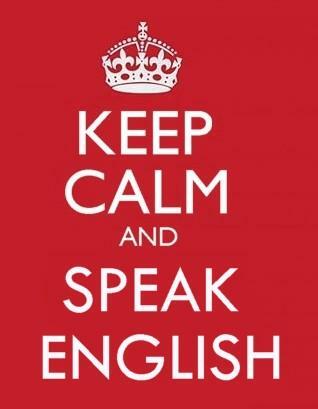 And if you are not…..well, you should be. I’m gonna go right back to the start here, with an omelette that a friend and I ordered at a 清真 qingzhen (Chinese for ‘halaal’) place right near the hostel we were staying in. I was originally pleased that I had so quickly come across a halaal place, from the outside, it looked fine. The inside, however, is another story. When we went through the hanging doorway things that the Chinese like so much, we were greeted with the sight of two guys casually sleeping on the wooden benches, and another sitting with a cigarette, or two. No one seemed in any hurry to get up, in fact they seemed more annoyed, but I guess I would be too had someone interrupted my sleep. As it was just our second(?) day in China, (or, first meal at least, anyhow), we didn’t feel like being adventurous (also because we didn’t know what any of the characters on the menu were, although there were some pictures) and simply opted for the omelette. While we waited, we were treated to some entertainment… a full-on fight broke out between the workers, even moving into the mini kitchen, that was really only big enough for the single person in there frying our eggs. Of course, all the fighting was accompanied by angry shouts, although not in Mandarin, as the majority of the 清真 qingzhen are Xinjiang places (a region in the northwest of China, where a lot of Muslims live and the language spoken is something closer to Turkish), and this place was no exception. With the action dangerously close to us, and with no signs of restraint, we were just deciding on making a hasty exit, when it seemed to calm slightly, and our omelettes arrived. Quite frankly, they didn’t look particularly appealing, nor did I have any appetite, but we decided we should make a go of eating them…with chopsticks. It’s not easy, I’ll have you know! (It also doesn’t help when you’re the only customers in there, in a tense environment) As it turns out, there was less egg than there was oil, and with nothing else to be done about it, we meekly requested the bill. We were given take away containers for our egg remainders, needless to say they were not eaten on return to the hostel. The next day, we stopped in a standard restaurant on the main road, (as opposed to the omelette place, which was down a hutong), and with me not confident enough to successfully order something without meat, and with my friend not feeling ready to eat any meat yet, we went for two bowls of plain rice. This was good for the first two chopstick-fuls, after which I truly realised how bland plain rice was (Yes, that was the Indian in me!) – not even any salt! My friend found out the hard way, that what we thought was soy sauce on the table, was actually vinegar, after she poured it generously over her rice. Oops.. Sometime also within that first week, we went to an actual decent 清真 qingzhen place we came across not too far from the hostel. We were given glasses of some sort of tea, which were continuously topped up by the friendly waiter even after just one sip. In a moment of braveness(! 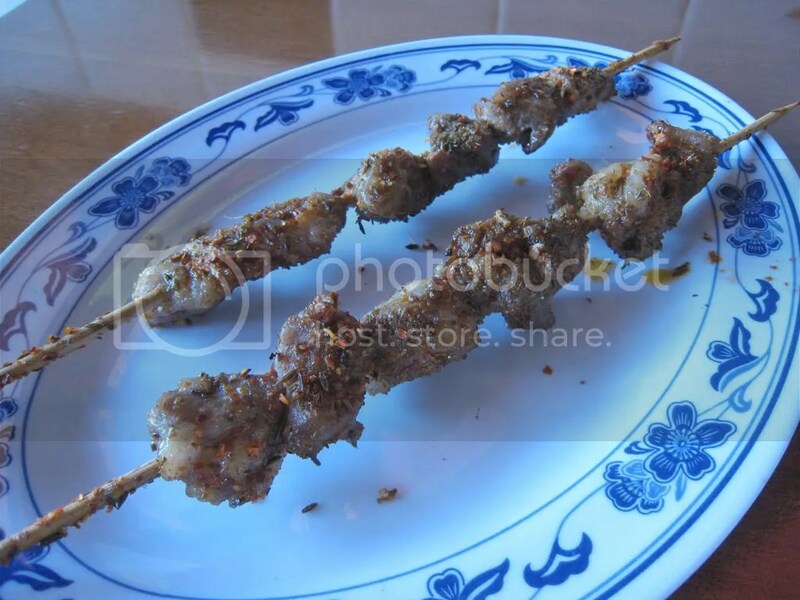 ), we went for the 羊肉串(儿) yangrou chuan(er) – skewered lamb kebab – a popular dish that originated in Xinjiang, but is now popular throughout China, particularly Beijing. The picture in the menu looked huge, so we decided to be safe and just order one each; it turns out they’re pretty tiny, but seeing as it took a very long time to get those two out to us, we assumed they might probably be annoyed with us for having just ordered two, when it took so long, so we didn’t order any more of those to eat with our rice. This is when we were truly struck with how cheap it was (or could be) to eat out in Beijing, with each skewer costing 3元 (if I recall correctly) and one bowl of rice costing 2元 – the approximate equivalent of 20p! Although, in my university canteen, it’s only 1元 for a bowl of rice. Now that’s value for money! It can only be good for you, right? 3. Scouted out one of Beijing’s Indian restaurants – Ganges – and enjoyed some (almost) homey food. Despite having brought the most commonly used Indian spices with me, it’s never as good as home. There are two main reasons for this; the first being that, okay, I can’t actually cook, I don’t expect it to be that good, and the second being…well, it’s China. Even making rice successfully is more of a challenge than it should have to be, this ain’t no Basmati – it took me a while to realise that I should stop waiting for it to turn out the way I’m used to! The grains aren’t going to separate nicely, it’s supposed to be sticky (that’s what I tell myself, anyway). I recently tried to make what would be a very simple lunch back home: tuna-sweetcorn sandwich. (Thanks go to the parents, for bringing these canned goods!) The first problem I encountered was opening the tuna can, which didn’t have a ring-pull lid like the sweetcorn, and like the other cans I’ve seen in China. 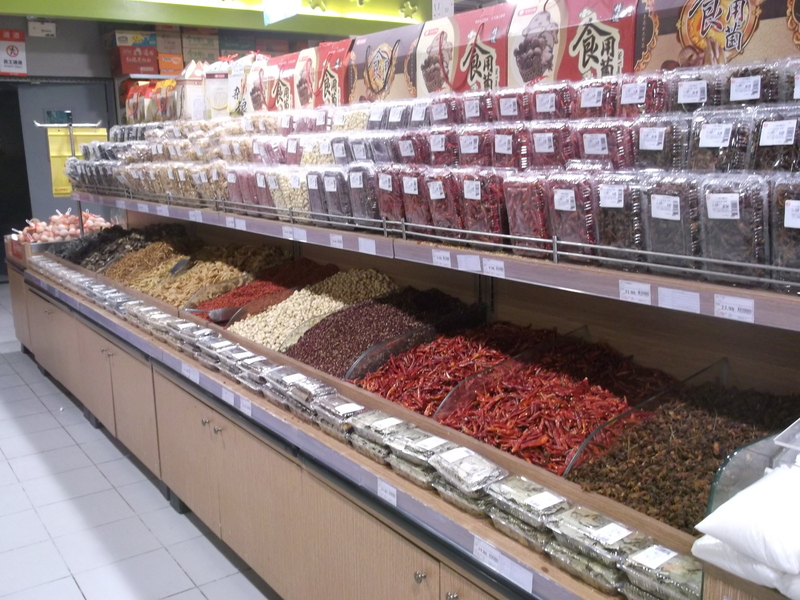 I have looked in every shop I’ve been in since I arrived in China for a can opener, and have found a grand total of 0. Well, the tuna wasn’t sitting around waiting for a can opener, so it had a battle with a knife, coordinated by myself, and while it put up great resistance against it’s opponent, it eventually lost. Believe me when I say I’m not being hypercritical (yes, it’s now my new favourite word) – I’m not expecting no Hellmann’s, but the mayonnaise, like a lot of the things in China that shouldn’t be sweet, was somewhat sweet. Thinking back, Kewpie Mayonnaise does sound similar to Cutie Mayonnaise… how sweet. Other common things that are unusually sweet are most of the bread, and milk. Overall, it was just a very strange tasting sandwich. Recently, I’d been on the prowl for (local) butter/margarine. Although the compound supermarket where I live actually had some mini tubs of (very yellow) margarine some time ago, when I went to buy some more, I found there was none, and the response I got when I asked was that they just don’t stock it anymore. I think she may also have said something about production, but I’m not sure exactly what. How convenient. 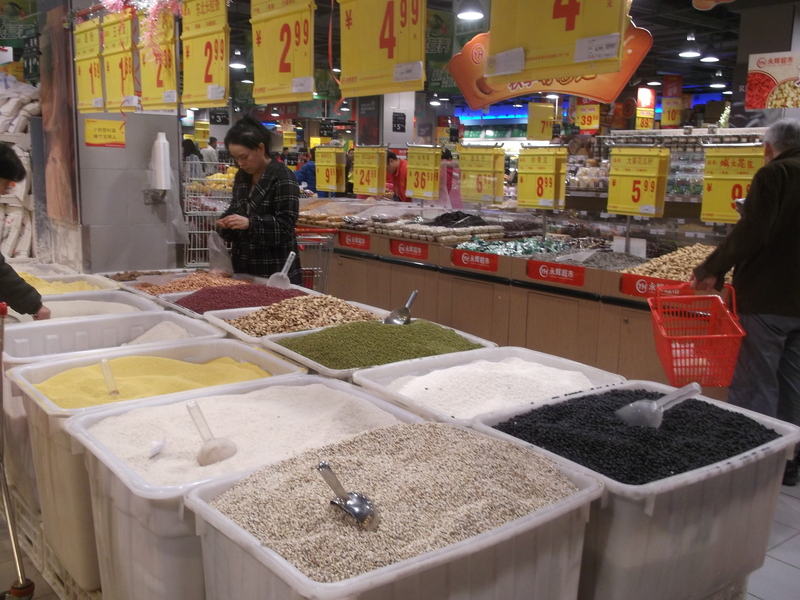 Of course, it is possible to buy butter at larger supermarkets, such as Carrefour, or even in the expat-rich areas of Beijing, but of course, it also comes at extra high import prices, or as we often say 太贵了tai gui le (too expensive). Last week, the compound supermarket surprised us by suddenly dedicating some shelf space to new products, namely cheese and butter. But wait, there was not only one type of butter, oh no, there was a CHOICE! Anchor Unsalted butter, or some Anchor Garlic & Herb butter if you fancy, and even tubs of Kerrygold spreadable butter. Mmm. The usual ‘cheese’ slices you can find in the supermarkets should not be allowed to be called cheese. This new selection stocked some vaguely equivalent Laughing Cow/Dairylea spreadable cheese, and a handful of blocks of Kerrygold Swiss Cheese. Just wow. Honestly though, I’m not expecting any stock refills once these run out. Seems like standard procedure unless the product in question is rice or noodles(!) Once my current Chinese margarine wannabe finishes, and there’s still Kerrygold left, I’ll take it as a sign that it was meant to be and will definitely be getting some of that! Our kitchen is only equipped with a gas cooker. Oh, and a kettle. Kettles are actually very useful – did you know you can boil an egg in your kettle?? …So I’m told, by friends who live on uni campus and don’t have kitchens (that are fit for use). I’ve discovered that woks are no good for frying eggs, but they’ll pass as toasters, black pepper is the thing that makes anything (Chinese dishes) taste instantly better, and oh – how I miss microwaves!! When pictures decide to start uploading again, there’ll be more about 清真 qingzhen to follow! Comments, comments – they do make me happy. As do microwaves. Posted in Foody, Lifestyle and tagged fight, food, halaal, Indian, Muslim, pizza, qingzhen, restaurant, rice, Xinjiang. Bookmark the permalink.